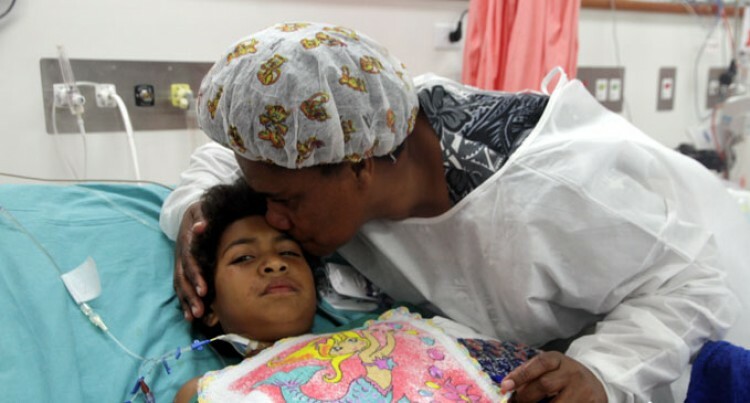 Adikeva Sauvaka was happy to see her ten-year-old daughter Sereseini Tikinimasei recovering after her open -heart surgery yesterday. Ms Sauvaka said; “Last year, I came to know that my daughter is suffering from an arterial septal defect. “My daughter used to have short breath, she was not eating food and gets tried so quickly while walking,” Ms Sauvaka said. “I am so thankful to God and the doctors for making this operation a successful one. Open Heart International Children’s Intensive Care Unit Doctor Subodh Ganu said; “We have been here for the past seven days and the operations are going really well. Dr Ganu said local doctors were doing a good job. “I think the cardiology team came to Fiji from Australia in March and April and went around the country looking for patients and they have done a good job in selecting the patients,” he said. The Assistant Minister for Health Veena Bhatnagar said: “The condition of the patients are perfectly all right and I congratulate the heart foundation team from Australia for doing an amazing and wonderful job and contributions they made towards our health and medical service. There were 38 patients who went through open-heart surgery.